Although the different versions of the Ping Zing Putter have slightly different configurations, they all have the same overall shape - pleasing curves that will appeal to you if you think modern putters are square and ugly. 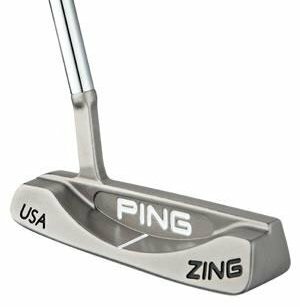 The original Zing had only a tiny notch on the top bar of the putter for alignment, making it difficult to use, although all the models you can buy today have a much longer line from front to back, which improves things greatly. I find the Zing to have a somewhat dead feel - a bit like hitting the ball with a plank of wood - there's no great sound like with the Ping Anser ... instead all you hear is a dull thud. Although it doesn't sound so good I find it excellent on superfast greens - because the feel is dull the ball doesn't jump off the putter face. 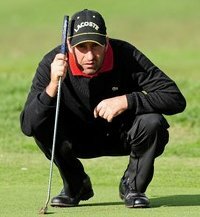 Although it's toe weighted, you don't feel that the toe is especially highly weighted, so no sensation that it wants to release sharply through the putt. Like all Pings the roll off the Zing is good, verging on excellent. 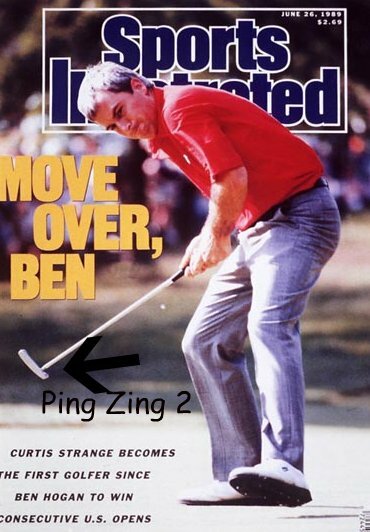 The Ping Zing was made famous in the 1980s & 90s by Jose Maria Olazabal and Curtis Strange who both won major championships using this design of putter.